An all-girl rockband signed to the record company Starlight Music. At first they consisted of four members, until Raya joined in on drums. They start out at the bottom, with a lot of competition from their rivals, the Misfits, as they climb to the top of the charts. Their music is always referred to in the cartoon in the 80's as "rock", which was the common word for that kind of music at the time, although pop perhaps describes it better. The main writer Christy Marx's own words to describe it is "bright, bouncy, generally up, full of positive and hopeful things to say about life. The four women harmonize beautifully together without effort". 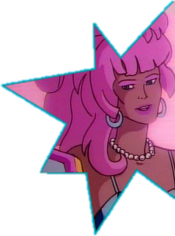 This intelligent and hard working business woman is the manager of Jem and the Holograms. She is also the owner and executive of the record company Starlight Music, which she inherited from her father along with the Starlight Foundation, a foster home for girls who were orphaned or came from troubled homes. Since Jerrica's and Kimber's parents died, she has also been keeping an eye on her younger sister, almost like a mother. 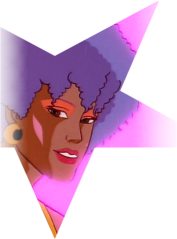 When she touches her starshaped remote microprojector earrings and says the words "Showtime, Synergy", the holographic computer Synergy projects a hologram over Jerrica's body which transforms her into Jem, the pinkhaired singer of the band The Holograms. 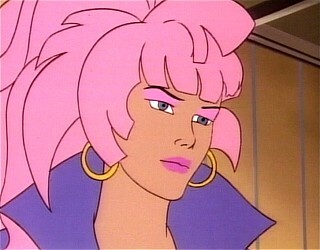 Only the members of The Holograms, know that Jem and Jerrica is the same person. Unfortunately her dual idenities are causing more trouble than she expected. As Jerrica she takes care of all the hard work at Starlight Music, while as Jem she gets to relax and cut loose a little more. The problem is that she can't be both at the same time, and she wants to be close to her boyfriend Rio even when she is Jem. Rio has fallen for both, unknowing of the fact that they're the same person. Jerrica wants to tell him, but fears Rio would be so hurt if he found out, that she would loose him. Lives/Works: Lives at the Starlight Mansion. Works at Starlight Music. Sounds: Jerrica: "Showtime Synergy!". Jem: "Show's over Synergy!". The Beginning, Starbright Part One: "Falling Star", Starbright Part 2: "Colliding Stars", Broadway Magic, One Jem Too Many, The Bands Break Up, The Fan, Hollywood Jem Part One: For Your Consideration..., Hollywood Jem Part Two: And The Winner Is..., The Stingers Hit Town Part One, The Stingers Hit Town Part Two, The Day The Music Died. 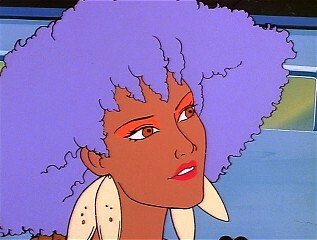 June 1 is Jem's birthday. She is a Gemini, dual personality. She is great at skateboarding, hang gliding (according to "Broadway Magic"), racing (she broke all the previous indy speed records in "Intrigue At The indy 500"), skiing ("Last Resorts"), swordmanship (in "Renaissance Woman"), acting (Starbright 3-parter, and nominated for an Oscar in "Hollywood Jem" 2-parter). Jerrica once called the Misfits and their music "trash". Jerrica would risk her life for the Starlight Girls. Jerrica sometimes gets tired about hearing about Jem, almost as if she is jealous of herself. According to Synergy, what Rio and Riot like about Jem is that she knows how to relax and have fun. And what Rio is attracted to about Jerrica is her inner self, which will always shine through her outward appearance. 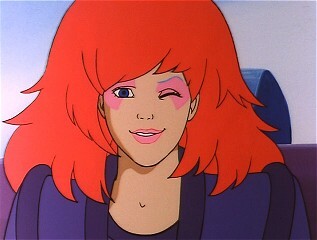 Rio once said Jem is alot of fun but that Jerrica is twice the woman Jem is. Jem has her own celebrity star on Hollywood BLVD (in the cartoon of course). Jem bets on number 22 on a roulette table. Maybe her lucky number? 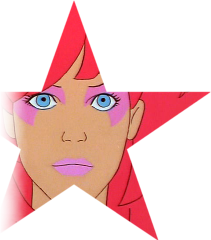 Jem changes makeup colors throughout the series, between pink, gold, blue or purple to correspond with the new dolls in the doll line. 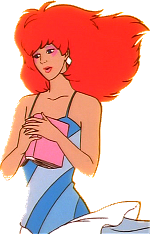 Fashions: See all of Jem's cartoon fashions at Cartoon Fashion guide: Jem. Jem: Present in all books. Jerrica's younger sister, and the youngest member of the Holograms. She is the keyboard player and songwriter of the Holograms, but she is brilliant with any kind of instrument. She tends to be a bit immature and less responsible at times. She always has guys falling for her, sometimes more than one at the time. She is about three years younger than Jerrica according to the Jem bible. She had the same haircolor all of her life. Kimber started playing guitar when she was little. Except for being a musician, she works at Starlight Music where she has her own office. But apparently she knows nothing about business. Kimber has a good hand with animals. She likes birds and thinks dolphins are cute. She used to spend time at Christy's stables when Emmett was alive, where her favorite horse was called "Lucky", it's white with a horse shoe symbol on it's forehead. Kimber is an extremely good swimmer, a great surfer and diver. She can be very brave. But is afraid of big spiders and extreme heights. 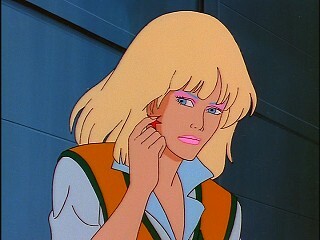 Kimber has an exact lookalike in princess/queen Adriana of Morvania, which is a fan of Jem and the Holograms. Not even her own sister can tell them apart. 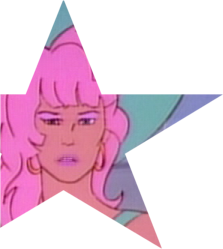 Kimber once suggested that Jem and the Holograms and the Misfits become friends, and Stormer practically agrees, but Roxy and Pizzazz don't. 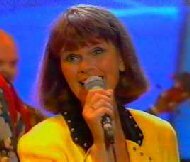 She later formed a short-lived friendship and musical career with Stormer on her own. Kimber has shown some interest in law, when she dug into real estate to save a historical building from being torn down. Her favorite radio station is KMAX, she practically always listens to it while driving. She keeps a diary. Here she sometimes writes down thoughts that turn into songs. Infact, she can write a song in only one day. According to Kimber's diary, Roxy is ignorant. Pizzazz is a rich spoiled brat. Shana can be ridiculously insecure about her talent. Kimber thinks Aja is cold sometimes. Sometimes Kimber wishes Jem was her sister instead of Jerrica. Kimber once got herself her own new tougher identity (with a very different look, with orange hair) when she asked Synergy to change her into someone hard and mean, someone who can never be hurt. Synergy reveals that Emmett Benton told her many things about Kimber, she was a born charmer, from the beginning she enchanted everyone, even butterflies, she was sensitive and suffered when she saw pain, but the knocks and scrapes of childhood did not stop her, she was creative, she was drawn to music and writing, she was often frustrated but kept at it. Kimber and Stormer's album, which was called "Back to Back", went double platinum. When it comes to music, according to Aja, if it didn't happen last week, Kimber is not interested. But apparently she likes the band the Monkeys. She tends to break her keyboard alot. It happens four times during the series, not always her fault though. Kimber admits she sometimes takes things a little too personally. Fashions: See all of Kimber's cartoon fashions at Cartoon Fashion guide: Kimber. Christel K�rner and Cisela Bj�rklund (Swedish). Released as a doll: Yes. 3 editions: 1st edition (by Hasbro), 2nd edition (by Hasbro), Kimber Benton (by Hasbro/Integrity Toys), The Bands Break Up Kimber Benton (by Hasbro/Integrity Toys), Tomorrow Is My Wedding Day Kimber Benton (by Hasbro/Integrity Toys). When she was only 11, she became the first girl to be adopted by Jerrica and Kimber's parents as a foster girl to live in Starlight House. Growing up togheter, Aja has become Jerrica's best friend and right hand. She plays guitar in the Holograms, and loves cars and motorcycles, so she is usually the resident chauffeur at Starlight Mansion when the girls are off to somewhere. She is the most athletic one of the girls, and makes sure the other girls stay in shape and play sports. She knows a little karate, which she has taugh Jerrica and the other Holograms, and she also knows a little chinese, both which she learned while she was very young and still lived in China. Sounds: "Tired already? It's only been 5 miles". All 65. Selection: The Beginning, Frame Up, Adventure In China, The Talent Search Part 1, The Talent Search Part 2, Britrock. She is the same age as Jerrica. She got along better with Rio when they were younger than Jerrica did, as Aja was a bit of a tomboy and Jerrica wasn't. She had the same haircolor as a kid. Fashions: See all of Aja's cartoon fashions in the Cartoon Fashion guide. Karin Glenmark and Birgitta Fernstr�m (Swedish). Released as a doll: Yes. 2 editions: 1st edition (by Hasbro), 2nd edition (by Hasbro), Aja Leith (by Hasbro/Integrity Toys), Glitter 'n Gold Aja Leith (by Hasbro/Integrity Toys). The second foster girl to move into Starlight House. She played the drums for a while, and later decided to switch to guitar. She also dreams of working as a fashion designer, and often designs clothes for the Holograms and Starlight Girls. She gives alot of attention to the Starlight Girls who get their share of tutoring in music, art and sewing. She is dating the director Anthony Julian. Lives/Works: Lives at the Starlight Mansion. Works at Starlight Music, and designs fashions. Sounds: "Starlight House, Shana speaking". All 65. Selection: The Beginning, Disaster, In Stitches, The Talent Search Part 1, The Talent Search Part 2, Mardi Gras, Out Of The Past. She was very shy when she arrived as a foster girl at Starlight House. She had the same haircolor even then. Shana used to go to summercamp. 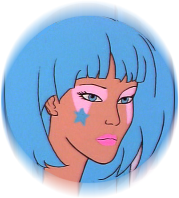 She was the first of the Holograms to have a boyfriend, as far as the series says, introduced to her by Lindsey Pierce. Shana is very faithful to Anthony, she has Anthony's picture in a locket. Fashions: See all of Shana's cartoon fashions in the Cartoon Fashion guide. Ann-Christine Magnusson, Monica Forsberg and Cisela Bj�rklund(Swedish). Released as a doll: Yes. 3 editions: 1st edition (by Hasbro), 2nd edition (by Hasbro), Shana Elmsford (by Hasbro/Integrity Toys), Glitter 'n Gold Shana Elmsford (by Hasbro/Integrity Toys). The new member of the Holograms, who took over on drums after Shana after winning a drum duel in the talent search held by Starlight Music. She has played drums since she was very young, and is also good with other percussion instruments. Raya is a bit shy but can have a temper when she's angry. She is the only daugther, with three brothers. Her parents came to the USA from Mexico and owns and operates their own nursery of domestic and exotic plants. Although she was born in the USA, she has slight accent from her parents, and she does speak Spanish aswell. Lives/Works: At the Starlight Mansion. Sounds: "When I joined Jem and the Holograms, it was the happiest day of my life". Raya had the same haircolor even when she was little. 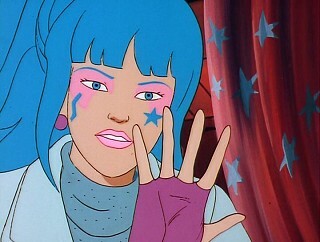 When Raya joined Jem and the Holograms it was the happiest day of her life. Raya has blue eyes, while the rest of her family has brown eyes. 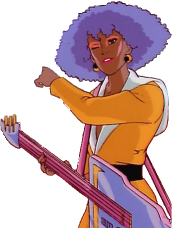 Mexico is where Raya's family comes from, but she had never been there until she went with Jem and the Holograms to record a music video there. Raya thinks Greece is one of the most romantic countries in the whole world. She is great at archery. Fashions: See all of Raya's cartoon fashions in the Cartoon Fashion guide. Behind the scenes: See the model cels of Raya. When Hasbro first told Christy about the new character Raya, she looked up "Raya" to see if it meant anything in Spanish, but didn't find much that made sense. So Christy came up with the idea of Raya just being a nickname that her father gave her. The last name "Alonso" was the name of a hispanic person Christy knew. With all the orphans on the show, Christy liked the idea of throwing an entire functional family into the mix, Raya's family. Released as a doll: Yes. In 2 editions 1st edition (by Hasbro), Raya Alonso (by Hasbro/Integrity Toys). In books: Annuals by World: 1988.